“The dinner is on me tonight!” shouted George as he was pulling out his wallet to pay at the cashier. “No man, I owe you for the help you gave me at work this morning. I’m the one who should be paying,” said Peter. Sounds familiar? If you have ever gone out with a group of Korean friends for dinner, you have probably found yourself in the middle of an argument like the one above, each person demanding that he should be the one who should be paying for the meal. It’s a sight rarely seen in any other country; in fact, why not just let everyone pay for their own meal? Then everyone would save money and not feel burdened by letting other people pay. But among Koreans, this logic seems to have no place in their mind. Instead, Koreans feel obliged to pay for everyone’s meals, why? 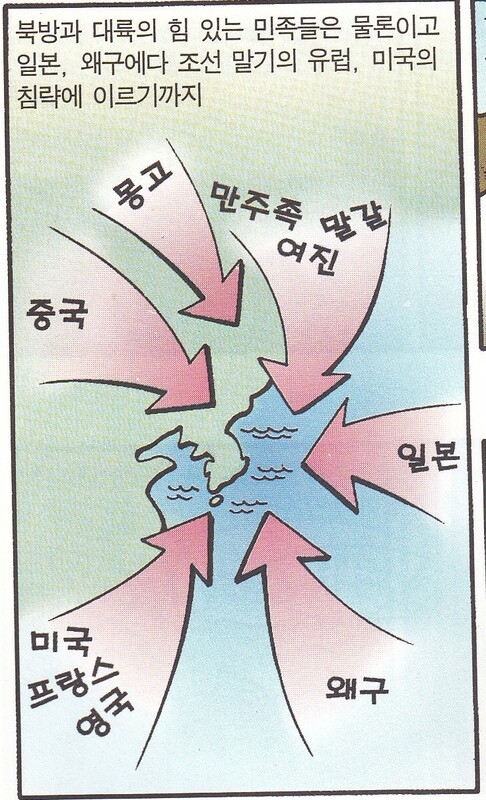 In order to understand this phenomenon among Koreans, we need to first understand their history. Because Korea is located on a strategically advantageous peninsula, Koreans have had to face numerous invasions into their country. Chinese, Mongolians, Japanese, Manchurians, Americans, French, British invaders have attacked the Korean people over 3000 times in total. Constantly faced with the danger of war, the Korean people realized that unless they worked together as a team, they had no chance of surviving. Psychologically, “I” became “we,” “individualism” was replaced by “fellowship among peers.” As a result, a perception of equality was formed within the population, where no one stood above others, nor was anyone below others. If this equality could be maintained indefinitely – equality in the idea of age, occupation, wealth, education -, then there would be no problem. But trouble occurs when that equality has been broken by someone advancing forward or by someone falling behind. If this happens, the remaining people either feel jealous of the person who advanced or, to describe it more accurately, feel shamed by the apparent evidence of their incompetence. Such sense of shame is even worse for the person who realizes he has fallen behind his peers. 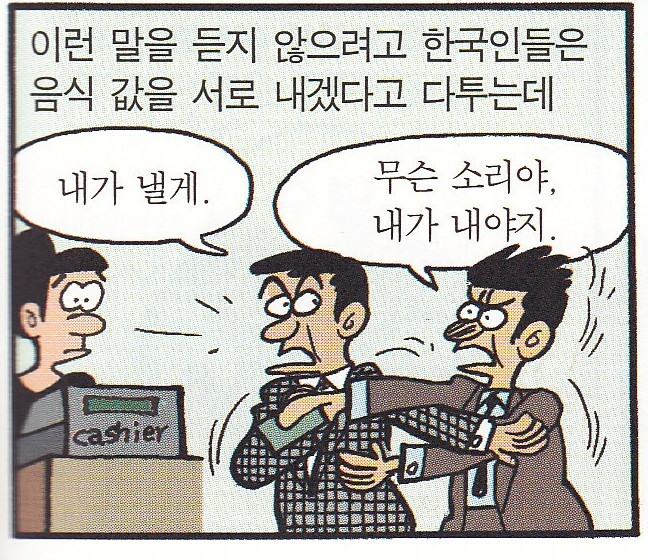 Therefore, to maintain equality, to strengthen a sense of fellowship among peers, to keep one’s appearances, Koreans argue with each other trying to pay for everyone’s meals. How can “we” each pay for our meals separately? – A family does not see each of its member pay separately; the father pays for himself as well as for his wife and children. But then a question rises, if one person pays for everyone’s meals, then wouldn’t that be levying an unfair financial burden on that fellow? Good question, but don’t worry about it. One person does not pay every time; the responsibility for payment is supposed to rotate around each group member until in the end, the total amount paid by each person becomes roughly equal. Overall, such strong identification with one another among Koreans results in a special kind of friendship called 정(情). Koreans truly value this relationship with each other, and once established, it often lasts a lifetime. This is a good insight into the Korean custom.